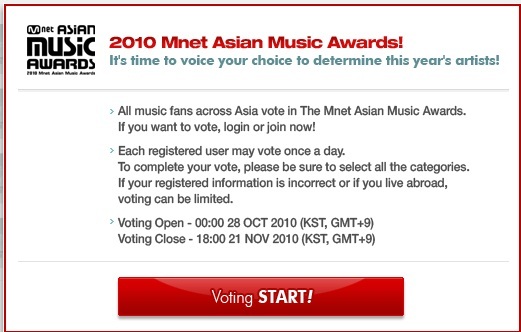 How to vote at “2010 MNet Asian Music Award” !!!! 3. Fill all of the data needed, then when you add your email address, click CERTIFICATION. Then Mnet will send you an email to give you the AUTHENTIC No. If you cant find the email in your inbox, try to search it in your spam. 7. There are 19 categories. if you want to vote, click the category, then pick the artist, and click the circle until it becomes red. after that, click next to go to the next category and do the same like what i said above until the last category. 8. 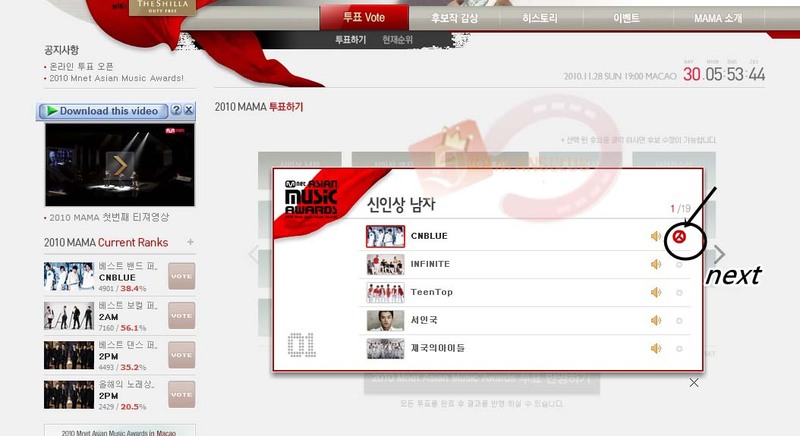 After you finish to vote, click ”Vote For 2010 MNet Asian Music Award” until the words “Current Rank” appears. If “Current Rank”is appeared, that means your vote is successful. Voting will be closed at 21 November 18:00 KST. And one ID is allowed to vote once per-day.